Today in Masonic History Henry Birkhardt Harris passes away in 1912. 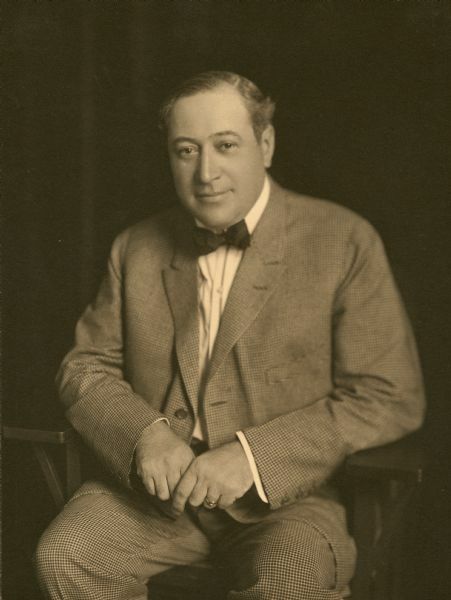 Henry Birkhardt Harris was an American theatre producer. Harris was born on December 1st, 1866 in St. Louis, Missouri. He followed his father, William Harris Sr. founder of the Theatrical Syndicate, into the the theatrical business at a young age. He first sold song books in the lobby of theaters. When the family moved to Boston, Massachusetts he continued selling song books in his father's new theaters. At the age of 32, Harris married Irene Wallach, who later changed her name to Renee Harris for her acting career. Harris continued to work for his father until 1901, when he began to produce plays on his own. He was also a talent agent for some big names stars of the time. In 1906, he bought the Hackett Theatre in Boston, which was later renamed to the Harris Theatre in honor of his father. Eventually Harris moved to New York where he leased and managed the Hudson Theatre on Broadway in New York City. In 1911 he built the Folies Bergère Theatre, which later became the Fulton Theatre and then the Helen Hayes Theatre on Broadway. On April 15th, 1912, Harris and his wife were traveling on the ill-fated RMS Titanic. They were traveling with another couple Taussig and the Taussig's daughter. According to Mrs. Taussing, when the Titanic first struck the iceberg, they ran out on deck and Mrs. Taussig, her daughter and Renee were on one of the first lifeboats to be lowered. When the two men tried to get on to fill empty seats in the boat they were met with pistols. Somehow Renee, who had already been injured on the voyage when she fell down the Grand Staircase of the Titanic, slipped off the lifeboat and remained on deck with her husband. Mrs. Taussig described watching her husband and Harris waving goodbye to them as the boat was lowered. Renee remained with Harris as long as she could and ended up on one of the last lifeboats to be lowered. Within five minutes of the last lifeboat being launched the boat sank. Renee's lifeboat was picked up by another ship and she sent word via radio back to the theatre letting them know that she did not know for certain what happened to her husband. In the chaos it was claimed that Harris sent a wire to his offices from another ship, this turned out to be false. His body, like many of the other victims of the Titanic was never found. Harris was a member of Munn Lodge No.190 in New York City, New York.